So Did the Pumpkins Come Out Early This Year? 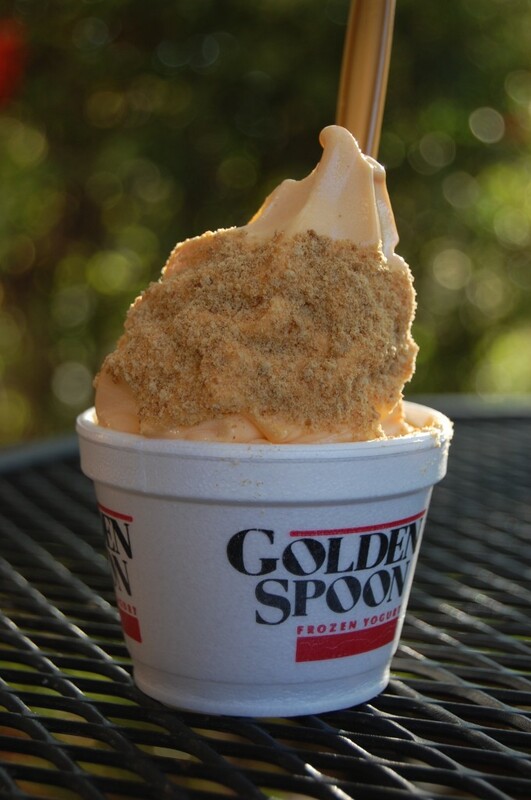 My lovely Golden Spoon pumpkin-flavored yogurt — from a previous year! So is it just me, or did pumpkin-flavored-everything arrive a little early this year? Still, it’s technically summer on Sept 1, and real-live pumpkins probably aren’t even ripe yet, but there we have it: Pumpkin Spice Lattes in Starbucks, Pumpkin-flavored yogurt at Golden Spoon, Pumpkin-Spice Eggo waffles in your local freezer section. … All available since Sept 1 this year. Not that I’m complaining, exactly. … I’m as much a pumpkin lover as the next gal, as I’ve mentioned before in my Ode To All Things Pumpkin. But the calories kind of terrify me. If I give in to my pumpkin cravings on Sept 1 instead of Oct 1, that’s a whole month more of pumpkin calories. Which, you know, aren’t a problem in and of themselves — pumpkin isn’t the problem. It’s all the sugar, fat, butter, whipped cream, cream-cheese frosting and everything else that goes ON the pumpkin delights that are the problem. I really can’t afford those for a whole additional month. I did cave and have one pumpkin-spice muffin that my darling daughter brought home from Einstein’s for me. This entry was posted in Holidays, Life After 40, Losing Weight by Lauren Christopher. Bookmark the permalink. Oooh, Carrie, that sounds DELICIOUS! (Especially because I love cream-cheese frosting, too!) And what’s up with our hubbies not liking pumpkin?!? !